1551 Trap Rd., Vienna, Va. Pop anthems “Girls Just Wanna Have Fun” and “True Colors” may have skyrocketed Cyndi Lauper to the heights of stardom, but the singer has been itching to try her hand at a country album since the days she spent playing music on the back porch of her friend’s home in Nashville. “Detour,” Lauper’s 11th studio album, is a collection of classic country songs dating back to the ‘40s from country greats like Patsy Cline, Wanda Jackson and George Jones. Recorded in Nashville, “Detour” features songs Lauper says she could relate to and believe. She brings her tour to Wolf Trap on Wednesday, June 1 where she’ll co-headline with Boy George. “You don’t want to just do a song, you want to connect,” Lauper says. The connection went beyond the 62-year-old singer and her music, to the many collaborators she worked with on the record including Jewel and Willie Nelson. Jewel lent her yodeling vocals to the track “I Want To Be a Cowboy’s Sweetheart” after Lauper’s attempts to quickly learn how to yodel came up short. Lauper says she had to work to stay professional while recording “Night Life” with Nelson because the experience was so surreal for her. “It almost made me feel like I was in Bikini Bottom like in SpongeBob Land just floating in the water because it just was so magical,” Lauper says. She promises to sing both new and old music in her show, but notes that even though “Detour” is her latest album release, it’s still “old stuff” and closely tied to pop music. Lauper says she remembers Cline and Loretta Lynn being on the radio when she was a child the same way pop songs are today. She also says the album is not as much of a stretch from her last project — 2010’s blues album “Memphis Blues” — as it might initially seem. “I thought the country one was going to be really hard, but once I found myself in it, I was OK. I think that all of it is the roots of the music I play. It’s a singer’s record. Of course I want to sing and I want to sing the roots of what popular music is because I love music. I really love music,” Lauper says. The New York City pop star’s passion for music goes beyond her own bubble of creativity. 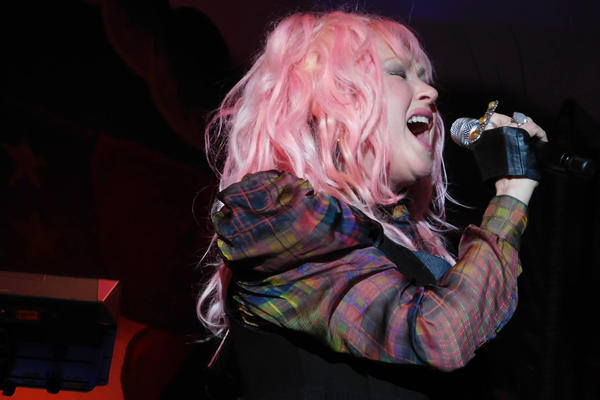 Lauper admits she keeps up with popular music today, specifically hip-hop and pop, and even incorporates new genres like the “beach-psychedelic” sound coming out of northern California on her song “Funnel of Love” on the album. She also takes time to check out international music charts to stay up to date on what people are listening to. “Because I don’t think you should sing at people, I think you should listen back,” Lauper says. As a long-time supporter of the LGBT community, listening is a skill Lauper, who affectionately calls herself a “friend and family member” of the community, has taken to heart in her personal life and social activism endeavors. She cites her sister Ellen, a lesbian, as a big part of why she is involved in LGBT activism. While some musicians like Pearl Jam, Bruce Springsteen and Ringo Starr chose to protest North Carolina’s HB2 law, which prevents transgender individuals from using the bathroom corresponding to the gender with which they identify, by canceling their scheduled concerts in the state, Lauper opted for a different approach. Lauper says she had to speak out.